I have always had a passion for animals and nature. 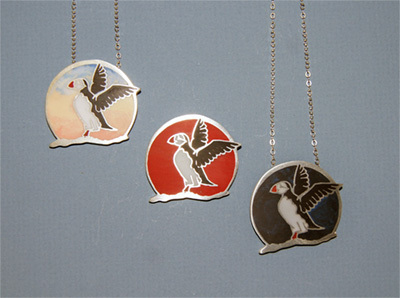 Since earning my BFA in Metalsmithing from the School for American Crafts, I have been able to combine my knowledge of silversmithing with my love of wildlife. Over the years, I have also incorporated my wildlife art into architectural etched glass, silk painting and pastels. When I first started this line of work, I knew I wanted to use color in my designs. In searching for a material to use in jewelry, belt buckles, boxes and knife handles that would be both tough and beautiful, I started to experiment with epoxy resin inlays. This material has continued to allow me to “paint” into my metal designs. 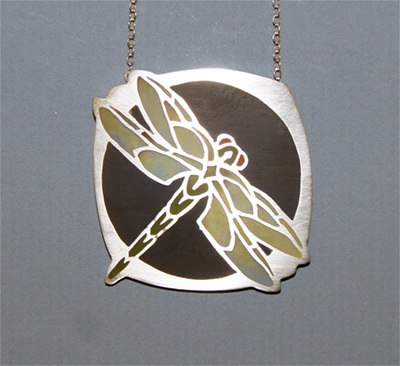 After working out the design, I use a jeweler's saw to pierce my design into a sheet of metal. Once the design is cut and refined, I solder a back plate onto it. This creates a recessed area that will hold the resins. After adding any findings to the piece, I start the inlay process, mixing the various colors that I will use. After the inlays have cured, I sand and finish the surface, and polish the piece. I spend hundreds of hours each year photographing birds, frogs, flowers, and landscapes in order to have the reference material for my work. Whidbey Island is the main location for my photographs. I have found endless inspiration from this beautiful island! 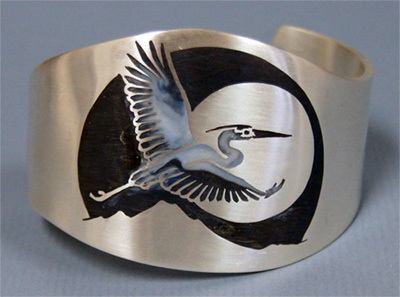 Watch Mary Ellen make an anticlastic cuff here.